Not every change we make at PBworks is a big one. Sometimes, we just want to make incremental improvements. This week, we release two enhancements that improve the overall polish and experience of the business product. 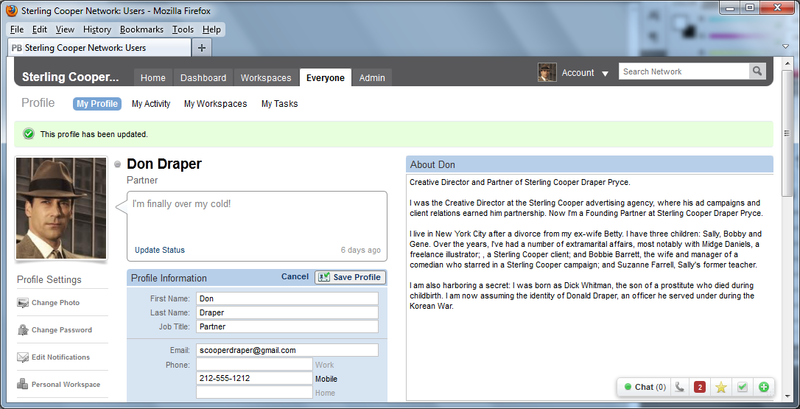 First, we improved the “Create Page” experience. 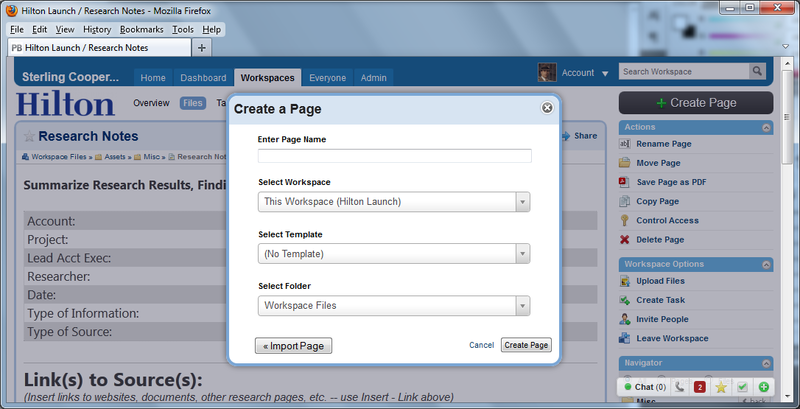 Previously, clicking the “Create Page” button brought you to a separate web page. Now, clicking “Create Page” brings up a standard dialogue box. We’ve also given you much more control over the page creation process. Previously, if you wanted to create a wiki page in a particular folder, you had to navigate to the folder before initiating the page create. Now, you can select the folder during the creation process. In fact, you can even select the workspace in which the page will reside (though we will default you to the current workspace and folder). 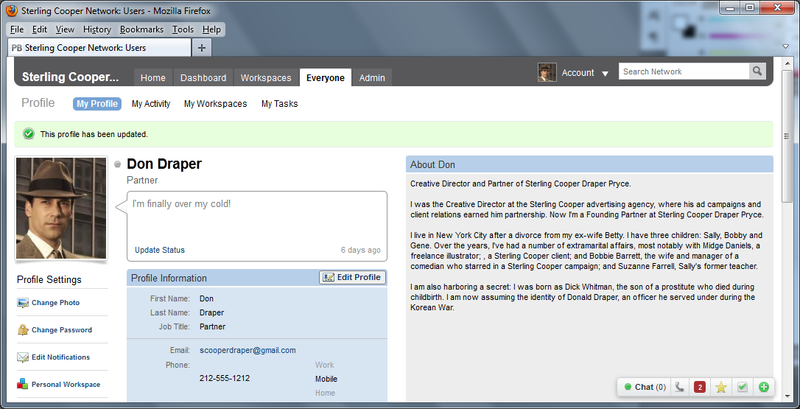 Second, we’ve improved User Profiles. Our usability testing showed that many new users had trouble figuring out how to edit their user profile. This wasn’t their fault; all the user profile actions were linked to from a dull block of identical-looking grey buttons. Even if they found the “Edit Profile” button, finding the nearly identical “Save Profile” button was a usability nightmare. Our improved user profile adds much more visual distinction between the different actions, and makes it very clear how to edit and save your profile. Watch for more such improvements in the months to come! 30Boxes was one of the first plugins we added to PBworks back when the service was still called PBwiki. This simple calendaring application let our users add a shared calendar to any workspace, and to have that calendar show up on multiple pages. And while 30Boxes has never been used by most of our users, it has a loyal following. Unfortunately, 30Boxes has become an “orphan” product. Its creators have moved on to other projects, and last week, the entire service suffered a 1-day outage. While service has since been restored, it seems clear that without future investment of resources, it is likely 30Boxes will become less viable. While we could simply keep 30Boxes as a plugin and simply offer it on an “as is” basis, we don’t feel that this is good for our user experience. Therefore, we have decided to phase out the 30Boxes plugin. The first step, which we have already undertaken, is to disable new insertions of the 30Boxes plugin. We cannot in good conscience allow people to add a service we fear will not be reliable in the future. The next step, which will take place on June 30, will be the disabling of the 30Boxes plugin. After that, existing insertions will stop working as well. It sounds like 30boxes is a key part of many of your wikis. As a result, we’ve come up with a compromise solution that will lessen our exposure to any potential 30boxes shutdown, while allowing you to continue using the product. On July 1, while we will no longer support the embedding of the 30boxes calendar, any existing embeds will link to the same calendar on the 30boxes.com website. This way, you can maintain access to 30boxes if you wish to continue using the product despite the warning signs, but we can prevent a 30boxes outage from affecting the wiki pages on which they’ve been embedded.